Are you a Facebook Platform developer or Page owner? Have you explored how much traffic flows through your page, how many people share your posts, or what posts receive the most attention? 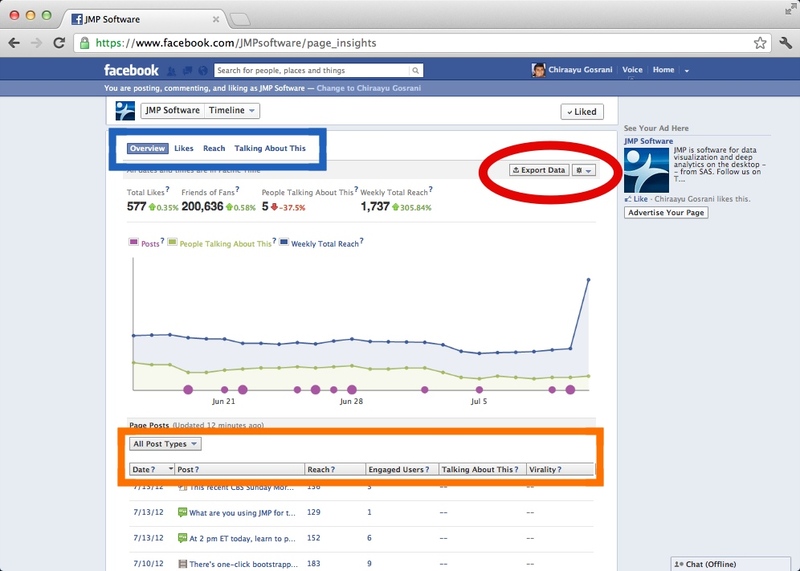 Last week, I used Facebook Insights and JMP to analyze the traffic flow and engagement of the JMP Software page. Once inside the Insights portal, there are several ways to collect and analyze the data. The uppermost tabs (in blue on the visual below) allow you to analyze specific forms of page-user interactions: Likes, Talking About This and Reach. The tabs at the bottom of the page (in orange) allow you to search for particular posts across type, reach, virality, etc. Though fantastic basic resources, Insights' analysis options only brush the surface. Fortunately, Facebook Insights also allows me to export the collected data in formats that JMP can use, comma-separated values and Microsoft Excel. I downloaded about a year's worth of data that I wanted to look at in JMP. Then I used JMP Graph Builder to make a few graphs that helped me better understand what's going on at JMP’s Facebook page. I particularly wanted to explore and visualize the data on the number of people who view the JMP page and the number of people who actively use the page, so I clicked-and-dragged those two variables into a single graph (see below). 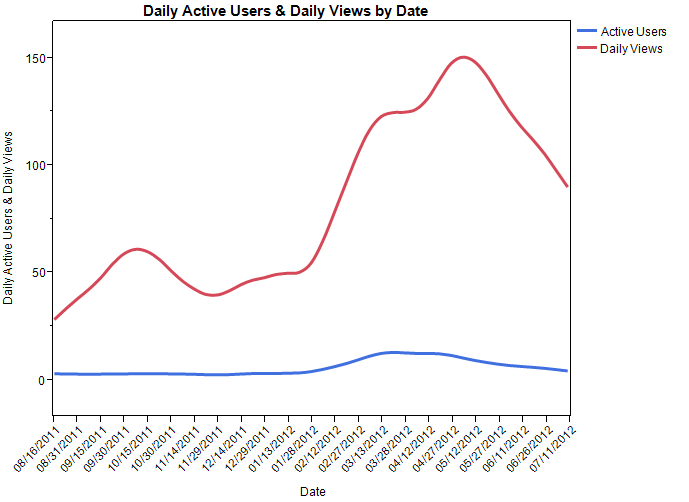 It was easy to see in this graph that while the number of daily views rises and falls over time, that number is much higher than the number of daily active users. That tells me we need to figure out a way to get JMP fans to interact with the Facebook page more. 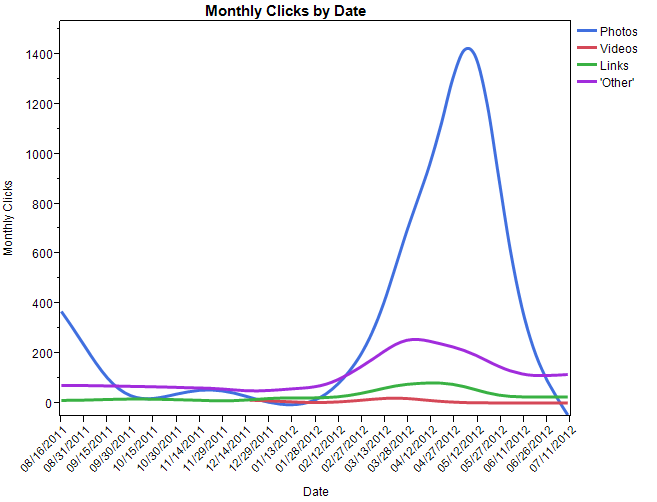 I also used Graph Builder to create the following graph, which shows the type of Facebook posts that received the most attention during the past 11 months or so. The graph indicates that primarily photos and, to a lesser extent, "other posts" engage users enough to get them to click on a post. Updates with links and video are less effective at getting fans to click. 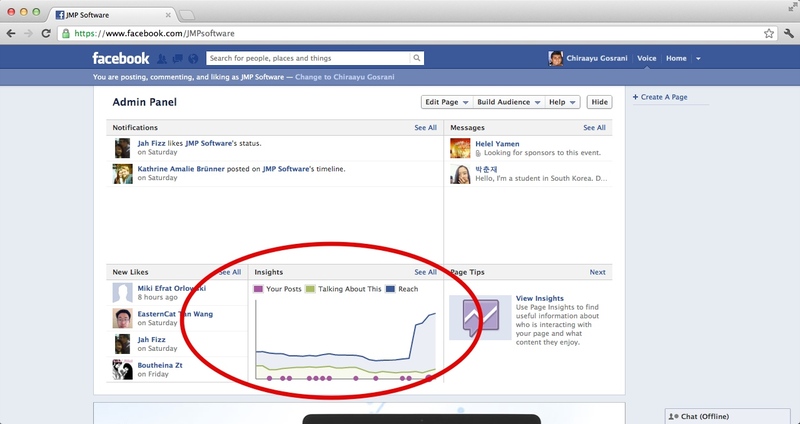 Using JMP and Facebook Insights -- JMP to analyze data and Insights to gather data -- was a fast and effective way to get solid information on the JMP Facebook page. If you don't have JMP, you can give it a try for 30 days for free and use it with your own Facebook data.